Our Children Need Our Help. What happened on Friday, 12/14/12 in Newtown, CT at Sandy Hook Elementary School brought this nation to its knees. This has happened before, way too many times. But this time it happened in an elementary school, to really young children who had their young lives stripped away entirely too soon. And the surviving children had their innocence taken away forever. I could go on and on about how terrible this tragedy is and all of the people who are affected and will forever be affected by this senseless act of evil. But the real question is, how can we as a society prevent this from happening again? I have no idea whether or not this particular person received help for Asperger’s Syndrome. I am also not implying in any way that Asperger’s Syndrome caused this young man to commit this terrible atrocity. I believe he did attend public school for a while and was then home-schooled. What could have happened with this young man that would cause him to become so enraged that he could do these horrible acts, not only to his mother, but to innocent children and school staff? We may never know the full answer. All we can do as parents, schools, and communities is anything in our power to not let this tragedy go down in history without having learned something from it. And most importantly, what can we do to reduce or even eliminate the chances of this ever happening again? I personally believe there are many things that can happen in a child’s life that can shape their personalities, their sense of empathy, compassion for others, and their morals. I could talk about violent video games, divorce, internet access, bullying, t.v. shows, gun control, latchkey kids, etc. But the two main things that are of utter importance in a child’s life are parents and schools. It begins first and foremost at home with the parents. There must be a solid foundation in the home with the parents as appropriate role models. Children are sponges and model the behaviors of their parents. Their sense of self-worth is molded through the years based upon not only the positive and actively involved attention they get from their parents, but also appropriate discipline. Children require and actually crave boundaries. It gives them a sense of security and accountability. Parents must be a strong, positive, and active presence in their child’s life. The second major influence in the shaping of a child’s identity, is the school system. The schools that I have personally been involved with are very receptive to parents’ concerns and do everything they possibly can to ensure that ‘no child is left behind’. In my opinion mainstreaming is a good thing. Could it be better? Most definitely. The one-on-one aspect of mainstreaming needs to be addressed. Schools are understaffed and staff is underpaid. Teachers are not only looked at as educators, but also as protectors of our children while they are in the confines of a school building. It’s a huge job to work with children, especially those with special needs. It is a job that is way undervalued in our society. We need to add more value to special educators, teachers, and school administrators by way of salaries and staff education. These kids are our future. Aren’t they worth it? The bottom line is that parents and school staff are the most important factors in a child’s life. 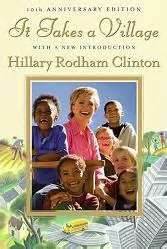 It Takes a Village, a book written by Hillary Clinton back in 1996, rings so true right now. That was 17 years ago. It’s really about time that we as Americans come together and come up with a solid plan to help the children of this next generation grow up to be confident, compassionate, empathetic, productive adults. If we don’t act now, we will continually be looking for ways of putting a band-aid on the problem – gun control, need for metal detectors in schools, home-schooling, etc – as opposed to preventing these types of acts from even entering a person’s imagination and acting on it. I thought the comments were very intuitive and could tell that alot of thought and research went into it. Thank you Cheryl! I really appreciate it.